I had a plan for my life. I knew what I wanted and I waited (not so) patiently for that opportunity. Then things didn't work out the way I wanted it to. Upheaval ensued. I like to have goals and a plan. I no longer had either. But God does work all things together for my good (Romans 8:28). He used that negative situation to draw me closer to Him. Through this process, I submitted to obedience. I am so glad I did! I have not regretted it one bit. You can read more about that here. One of the many things that I love about God is how he uses all kinds of moments to get me thinking. The other night we had a really bad storm. I woke up when the electricity went out. Then B-man woke up scared because his lamp was off. He crawled in bed with us and decided to use my belly for his pillow. I laid in bed soaking up the moment, listening to the storm and B's breath as he quickly fell into sleep. I can't remember what made me think about obedience and waiting in this situation. Maybe it was because I was waiting for the lights to come back on. I have no idea. Obedience is easy when God is asking me to go do something. I'm a do-er. I like to serve and do things. I am action oriented. I like to discuss ideas but I love to act on them. Obedience is hard when God is asking me to wait. To stay still. To not act. Torturous. It's in the waiting that I begin to doubt God. Is this really what you want me to be doing? Shouldn't I be doing X, Y or Z? But that's the lesson, right? To learn to wait. To trust God no matter what He's asking (or not asking) me to do. Oh, it's so hard!! He's asked me to do some hard things. I can specifically think of 2 conversations that He called me to have that were hard, very uncomfortable. Another glorious conversation that led to the beginning of Valuable. I've come to enjoy hard things. Waiting is hard in a different way. I want to rush forward. I want to take action. In the Spring, I read Genesis. I realized that the entire book of Genesis is about people who KNEW that God had a great plan for them. They actually physically heard from God. But they could not wait. They knew the plan but tried to do it their way, not God's. And messed it up. But God redeemed all those situations. I'd rather not give God a situation to redeem. I'd rather do what He wants me to do the first time. My daily devotional this morning was about waiting, being on the shelf. "It can either erode your faithfulness or enhance your faithfulness. It's all in how you choose to respond." Pastor Tom mentions 3 things we need to do while we're waiting: choose to be forgiving, choose to be patient and choose to be faithful. You make sure you don't have any bitterness in your heart. You make sure you're not running ahead of God. And you continuously choose obedience. 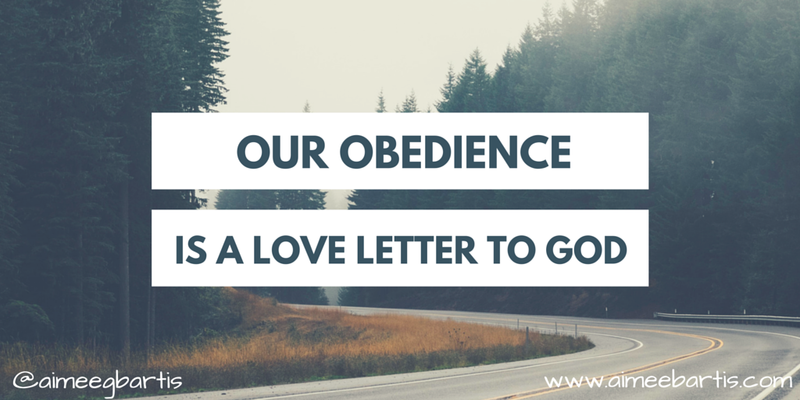 Obedience isn't a gift we give God. It's not something we do so that He'll do something for us. It's a way we show our love to Him. He has given us such a wonderful and free gift of salvation. Our actions after we receive the gift of salvation are not an effort to continue earning that free gift. Our actions after salvation are a response to that gift. A continual love letter, a thank you card to our LORD.